Developing graphical scheduling applications can be overwhelming if you don‘t know where to begin. There are many facets with a significant influence on the user experience and on the information value of your application. Use this checklist to ask yourself the right questions before you develop a Gantt chart application. Although the Gantt chart seems to be a “trivial” visualization technique, it can bring a lot of horse power to scheduling applications. In addition, it has a high degree of sophistication under the hood. When people start developing and using visual applications (like a Gantt drag & drop scheduler), the appetite comes while eating. Many Gantt chart applications fail (or do not unleash their full value) because the underlying Gantt chart technology is not “B2B applications proof”, or does not scale with the requirements. 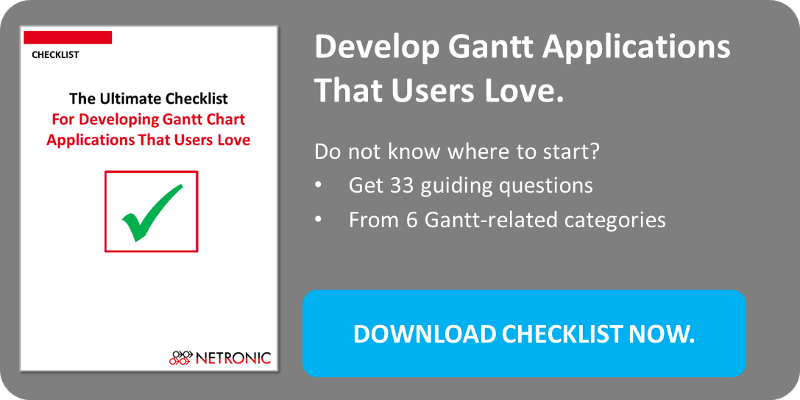 The purpose of this checklist is to help both .NET and Java application developers and application architects to develop scheduling Gantt chart applications that users love. Hence, this checklist provides you with 33 questions which we recommend to answer before starting the development. It is structured around common issues related to the development of scheduling applications with interactive Gantt chart functionality. Be clear if you start from scratch (most unlikely) or if you have some kind of starting point or existing application which you want to enhance or replace (likely). In the likely case that you do not start from scratch, list both the top three features and functions that you definitively want to keep in the application and the top three capabilities that you miss most. Scheduling applications are not l'art pour l'art. They serve a specific business need or should improve certain business processes by providing transparency and drag & drop capability to scheduling data. Be aware of the bigger picture into which your Gantt application fits. Understand the users and their needs. Develop an understanding of your data and how they should look like in the Gantt charts. Think about hierarchy levels, different views (user specific? ), dependencies and specific information which you definitively must visualize in the Gantt schedule. This brings together the application use case with the Gantt chart essentials. Translate the specific use case into visual alerts and interaction rules and behaviors. The technical stuff relevant for all software developers: programming language, runtime environment etc. Each and every Gantt chart application has a backend. This may be your ERP system or an in-house created Excel application. Just make sure that you define data, data sources and any dependencies properly. I recommend our blog post about Gantt Charts: 10 Simple, Yet Powerful Features.